Mail day! Thank you Ral Partha Europe! I can't seem to take a clear photo with my phone for days now, so it's a bit blury, but the Meier dragon and two skeletal ogres arrived. I'm dying to start on these right away, but have some other things to work on first. 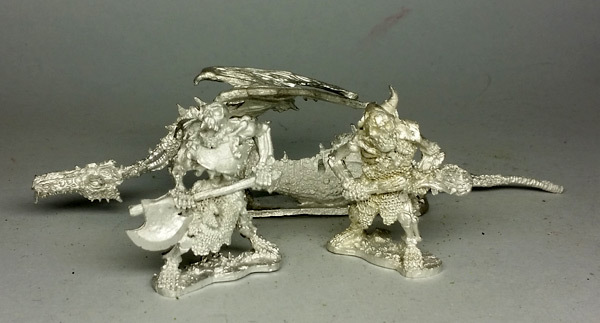 I am also thinking about taking a shot at sculpting the ogres a couple of friends before I paint them. Not saying that I will be successful... but I think I'd like to take a shot at it. The ogres are a little bigger than the old Golgfags I'm using with the Undeadish, but I'm OK with that. Scale is all over the place in this project, and it still looks OK. The dragon is the perfect size for me. 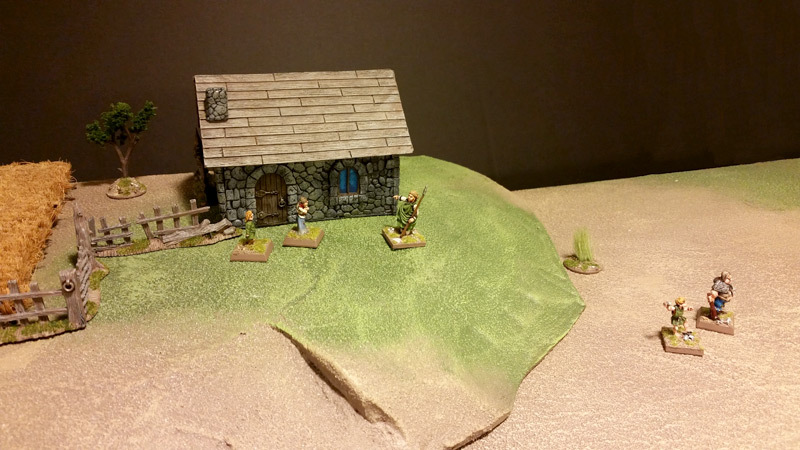 In fact, it's close to the same size as The Caller's mount that I previously painted up. I will post some better pics with other figures for scale at some point. Also of note, the dragon is in four parts, and they key into each other really well. They need t a bit of filing to get them to fit, but once that's done I shouldn't need to pin the pieces. Very well sculpted. But I suppose that's to be expected. Tom Meier has always been one of the best. I also stumbled upon one last, and very small, dragon from my old collection. Old enough that I had painted it with enamels! It's a Grenadier figure, and I think it was called a young forest dragon or something along those lines. Smaller than the Meier dragons. I'll get a pic sometime soon. That table is looking great! And as an aside, I really appreciate your posting frequency. Nice to look at my reading list, and so frequently have a little update from you. That zombie dragon is a great model - I bet you'll do it justice. I painted one as a commission when I was a teenager, and when working on my own undead army last year, I experienced a little pang of regret that I didn't have one of my own. That said, I'm not allowing myself to buy one on the basis of having too many other projects. @warfactoryuk: I thought "too many projects" was a forbidden phrase among wargamers. @lasgunpacker: Thanks. I confess that this has become my escape from reality in order to keep my sanity. Or at least lose my sanity in a generally safe, if somewhat eccentric (to non wargamers) way.